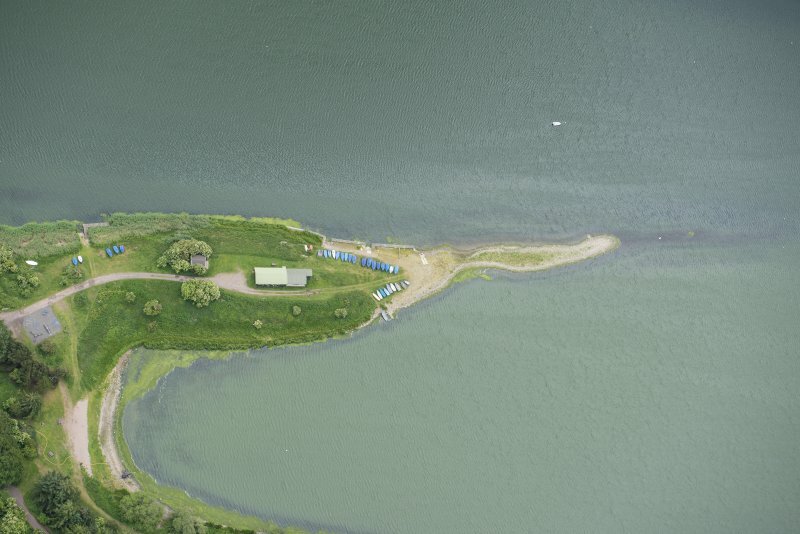 Oblique aerial view of St Margaret's Inch, Forfar Loch, looking WSW. 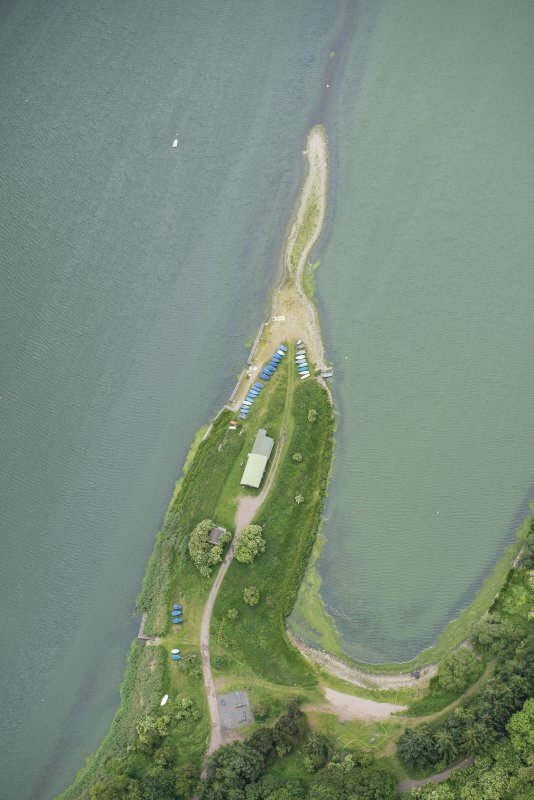 Oblique aerial view of St Margaret's Inch, Forfar Loch, looking S.
Queen Margaret's Inch was the name given to a crannog set on a now-exposed ridge running out into the loch of Forfar. The crannog, exposed by the draining of the loch in 1781, was excavated by Stuart (1875) in 1868 who found it was composed of oak piles, logs and large stones overlaid by what appeared to be midden material and soil, Nothing is now visible. In 1781 objects including ear-ring like, silver ornaments, thirty to forty chessmen and bronze vessels were found, the latter being sent to Glamis Castle (NO34NE 1). There is now no trace of the crannog. The ditch cutting across the ridge remains 4.0m wide and 1.0m. deep. It is thickly overgrown but a slight bank 0.2m high is apparent on its southern tip and an even slighter bank 0.1m high on the north. Even now only a narrow neck of land is exposed between the ditch and the site of the crannog on the crest of the ridge. Queen Margaret's Inch, named from a tradition that that queen (1070-93) had a residence on it, is said to have been occupied by a cell of two monks of Coupar Angus Abbey in 1234. In 1508 mention is made of the "building and repair of the Chapel and houses" and in 1605 the Inch is mentioned as being formerly "The Chapel of the Holy Trinity and now St Margaret's Inch." A building is said to have remained as the Inch until the end of the 18th century but Stuart (1875) found only a fragment of a 15th century pillar. A farmstead nearby is said to have been built of stone from this site. Two fragments of walls cross the ridge E-W where the crest begins to fall on the SW. They lie 6.0m apart, one slightly below the other. They were noted only at a point where a well-worn foot-path runs along the length of the ridge, and it is probable that they formed part of a revetting wall round the chapel. New Statistical Account (NSA) 1845; J Stuart 1875; C M Piggott 1955; Visited by OS (JLD) 14 August 1958. Queen Margaret's Inch is a natural gravel ridge projecting into Forfar Loch and made visible when the loch was partially drained in 1781. Excavation in 1868 revealed that a ditch had been cut across the neck of the promontory and that timbers, midden material and earth imported from the shore had been used to level and extend the highest point of the ridge. Finds recovered during the drainage operations of 1781 included 'silver ornaments like ear-rings ', bronze vessels and thirty or forty bone playing-pieces, one which is in the National Museum of Antiquities of Scotland (NMAS NS 1). Whilst the island is traditionally associated with Queen Margaret (10 70-93), a cell of the abbey of Cupar-Angus is recorded here in 1234 and in 1508 a reference to the chaplaincy of St Margaret's Inch mentions the building and repair of the chapel and houses. J Stuart 1868; J Stuart 1875; RCAHMS 1984. NO 441 506 Proposed development for a new stores building necessitated trial work in November 1995 on what is considered to be the site of the medieval chapel of the Holy Trinity, founded in 1234. Three trial trenches were hand excavated. These revealed well-preserved archaeological levels close to the present surface down to a depth of at least 1.1m. The archaeology comprised stratified layers and features such as a stone wall and stone spreads. Dating is uncertain, but pottery recovered would suggest the medieval period. The foundation design for the new building was considered to be non-destructive to the archaeological levels and further work was not required.